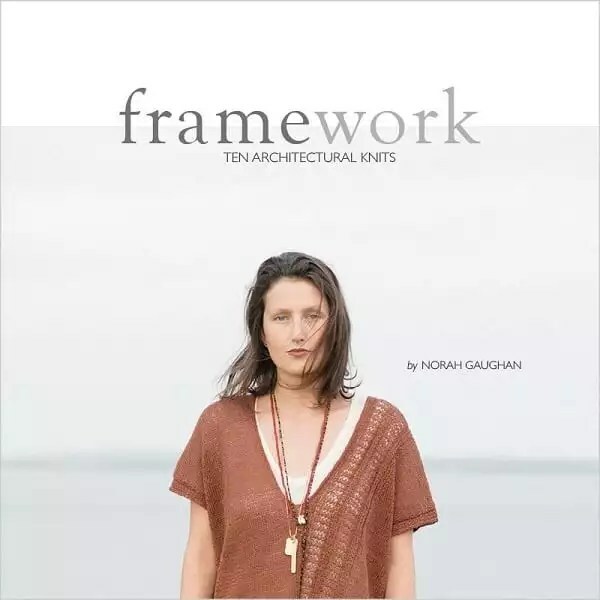 Framework: 10 Architectural Knits by Norah Gaughan is the Yarn Thing we discussed today on the Yarn Thing podcast with Marly Bird! Raised by artists in the Hudson Valley (her father, Jack Gaughan, was a well known science fiction illustrator in his day) Norah was immersed in both art and the needle arts from an early age. She went on to earn a degree in Biology / Art from Brown University. During the years that followed Norah concentrated on her greatest love, knitting. First as a freelancer for yarn companies and knitting magazines; then as the design director at JCA and more recently, as the design director at Berroco where she headed up the design team and published sixteen eponymous booklets. Norah’s upbringing, schooling and experience coalesce in her two hardcover volumes Knitting Nature and Norah Gaughan’s Knitted Cable Sourcebook. Her most recent publication is “Framework” 10 architectural knits in Quince & Co linen yarns. Norah combines her love of geometry and her mastery of innovative construction in Framework: Ten Architectural Knits, a collection of ten breezy pieces worked in Quince & Co’s organic linen yarns, Kestrel and Sparrow. From a summery little neck scarf to a godet-trimmed, shoulder-baring top to a free flowing open cardigan knitted in different directions, Norah’s collection offers ten projects that are a pleasure to knit and flattering to wear. Framework delves into the underlying structure of her pieces—the simple rectangle—and how various knitting techniques transform this basic shape into new and interesting knitwear. Illustrated tips on essential techniques, such as yarnovers in knit and purl fabrics, short rows, twisted fringe, and more are also provided throughout the book. Print version available at Quince & Co.
Marly mentioned her love of the cable stitch dictionary, Knitted Cable Sourcebook. 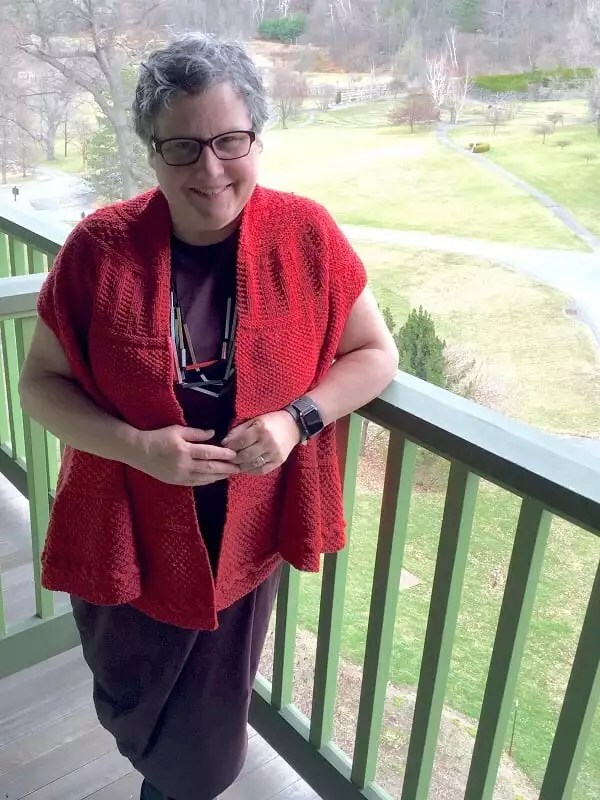 Find Norah Gaughan updates through her website, www.NorahGaughan.net, Facebook, and her designs listed in Ravelry, plus Instagram and Pinterest. Great podcast today. So interesting to hear how an amazing designer got her start. Her designs are inspiring. I had to go check out the patterns on Ravelry and her book on Amazon. Walkway is so classy looking. It would be a pleasure to wear. Thanks for a great show! For the first time in a while, I got to listen to this interview live! I’m away on a work trip and listened while hiking the walkways of the capitol building in Austin, TX. It was a lovely way to spend the morning. Thank you so much for the chance to learn about Framework and for the interview! Checked out Walkway, and several others, on Raverly. Beautiful Springtime Knit. Another delightful podcast and such an interesting guest! I would be proud and flattered to wear her designs down any walkway! Norah’s designs are amazing! I can’t imagine any one who wouldn’t be proud to wear them on the celebrity runway or their neighborhood walkway! Norah’s designs are beautiful… I think I need to give linen a try after listening to this podcast. Walkway looks like the perfect summer sweater! Great and interesting podcast today. I can see why Walkway is one of the most popular designs! I loved this podcast. I hope I can get a chance to knit some of her patterns so I “walk this way “. I was laughing listening to Marly saying over and over again, “I’m trying to give you a compliment!” I had the same reaction when I first saw the collection – “Really that’s Norah Gaughan? !” I think it’s great to be reminded that while a designer may be known for a particular style that their talent extends to many styles. What a lovely collection, and I can see why Walkway is the most popular. Walkway is a lovely piece in this collection and it is a perfect design for the yarn. I bet it will wear well and be a perfect summer garment. Great podcast as usual! Love Norah Gaughan and her cable book! Newest book looks like a keeper as well. Her walkway pattern is beautiful and timeless. The summery look of Walkway would be so comfortable to wear. Enjoyed the podcast with Norah Gaughan – thanks for the show! Walkway is lovely. All the designs are so beautiful and innovative. A beautiful collection. Enjoyed the podcast and love all of Norah’s designs. The Walkway design in the Framework is beautiful and need this book in my library. I love Norah’s amazing and creative designs. Walkway is one of my faves in Framework. Oh my goodness, I love all of Norah’s patterns in her new book – Walkway is just the beginning! Thank you Marly and Tammy for yet another excellent episode! I would love to win Norah’s book Framework. The pattern Walkway is so beautiful I would want to make that. I love Norah’s patterns and her new book makes me what to try linen yarn. Walkway looks like a great summer piece. I really enjoyed the podcast. Thanks Marley and Norah. Walkway is indeed lovely. I love using linen yarn. Walkway seems so lovely. I’m mostly a crocheter but I would be up for a try at knitting if I won this beautiful book. Great interview and big fun…as usual! Knitting paves the walkway for peace & relaxation. What a great podcast and Walkway is great also! Such a huge fan of Norah Gaughan and linen, this book is so wonderful. Walkway is one of my favorites. Walkway is pretty, but I cast my vote for Arena as the one that would work best for me. I also love the shawl. I never thought about making one in linen. So many good ideas in this book. I enjoy all the Yarn Thing podcasts on my car ride to and from visits with my granddaughter. This afternoon I plan to take her on the Walkway over the Hudson. I especially enjoyed the Norah Gaughan podcast. I have long admired her designs- simple, practical shapes with unusual stitch elements. I’d travel any highway or trek any walkway to take another class with Norah! Walkway is a super cute summer tee! I think I might need one for today’s hot weather! I am attracted to patterns that have an architectural look to them and love the patterns in Norah’s book. Not sure that I can pick a favorite, but Walkway is very pretty and Norah said that it was her favorite. I bought some Quince and Co linen to make a large scarf/ wrap but haven’t started it yet. I think that Walkway pattern would look great in their dark purple. I have several of Norah’s books in my collection already. I think Framework might just have to join the others! Walkway is one of my favorite patterns in the collection. I’ve never walked on a walkway, but Norah’s patterns are beautiful! I have been a big fan of Norah’s designs for a while. I’m also a big fan of linen since i live in texas. And now I’m a big fan of walkway. I also live in the Mid Hudson Valley in NY and enjoy the walkway over the Hudson. I would make that sweater thinking of that beautiful place.